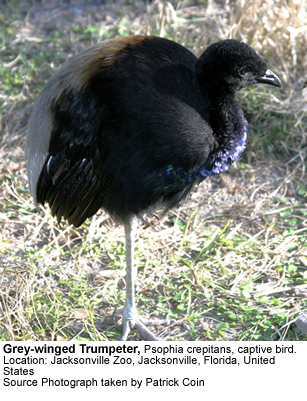 The trumpeters are restricted to the forests of the Amazon basin in South America. They are named for the trumpeting call of the males. The three species are dumpy birds with long necks and legs, and chicken-like bills. The plumage is soft, and they are weak fliers. They are fast runners. These trumpeters nest on the ground, laying white or greenish eggs. Their food consists of insects and fruit. In Venezuela and Brazil (where it is known as jacamim) they are often used as "guard dogs" because they are adept at killing poisonous snakes.